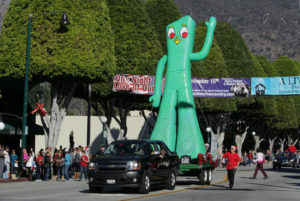 Fans gave the Clokey family, Gumby and a 60-foot jolly, green inflatable version of the world’s original clayboy a warm welcome as he made his way down Hollywood Boulevard in the annual Christmas parade on November 27, 2015. The giant helium filled Gumby was wrangled by volunteers from the Make a Wish foundation. 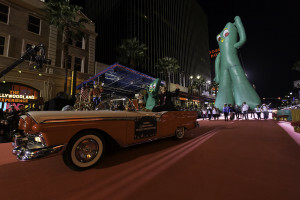 The Gumby mascot and the Clokey family (creators of Gumby and the Gumby TV series) waved to the crowds from a red hot vintage convertible. The Clokeys, and their partners NJ Croce and NCircle Entertainment donated hundreds of bendable Gumby toys and DVDs to Toys for Tots. Enthusiastic fans lined the streets of Hollywood for the parade while millions more viewed it from the comfort of their homes. It was broadcast on the CW, the Hallmark Channel, American Forces Network, and thousands of local stations throughout the country during the holiday season. Gumby was a little star struck hobnobbing with celebrities in the green room, and they were just as thrilled to meet him. 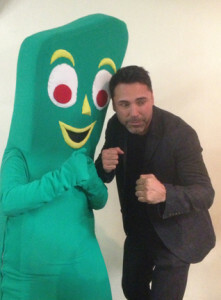 Boxer Oscar de La Hoya went a round with Gumby. 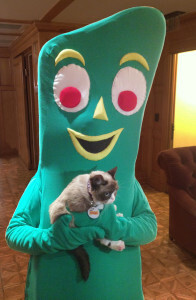 Grumpy Cat enjoyed being held by Gumby, but still wouldn’t crack a smile. The parade was hosted by Erik Estrada (of CHIPs fame) and Laura McKensie (TV travel expert). Special guest hosts included Montel Williams, Dean Cain, Elizabeth Stanto and Garrett Clayton. La Hoya boxes with Gumby. While the night air was chilly, energetic performances by favorite performers warmed spirits in a crowd-pleasing concert that kicked off the parade. Clay Aiken, Taylor Hicks, Alexander Jean, India Arie, Daughtry, Diana DeGarmo, Candice Glover, Kat Graham, Sean Kingston, Heather Russell, Ruben Studdard, Ace Young, the Masters of Illusion from the CW, and the Band of Merry Makers entertained the cheering crowds before the parade. Music, equestrians, balloons, star cars, costumed characters and marching bands made for a magical evening for all ages. Learn more about the Hollywood Christmas Parade. 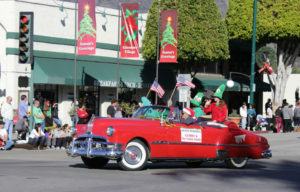 Gumby and the Clokey family were honored as Grand Marshals of the Glendora Christmas parade on December 14, 2013. Gumby appeared in person to hug and high-five fans. A 20′ tall inflatable Gumby made his way down the streets, bowing to the crowd. Gumby did as Gumby always does… he brought a smile to every face. Generations of fans lined the streets to cheer for this beloved icon. The city of Glendora considers Gumby their son, because Gumby’s studio, Clokey Productions, was located in Glendora in the 1960s and 70s. Gumby grew up in Glendora! Art and Ruth Clokey produced 85 Gumby episodes in a Glendora warehouse, which were syndicated worldwide. Clokey Productions also created 65 Davey and Goliath episodes and six specials through the mid-70s. Gumby’s studio then moved to Sausalito, California, where another 100 episodes were made in the 80s. The city of Glendora also chose Gumby and the Clokeys for this year’s parade as a kick-off for the first annual Gumby Fest. Gumby Fest, scheduled for Saturday, June 14, 2014, is Glendora’s fun-filled celebration of all things Gumby and stop motion animation. Joe Clokey (Gumby’s brother) will present, “Gumby Through the Years” a wonderful retrospective of Gumby’s journey. Animators and crew who worked on Gumby productions and other well known animated films will take part in discussion panels. Fans will have an opportunity to learn about the 60-year history of the character and see clay puppets and sets at the temporary Gumby Museum. There will be screenings, demonstrations, hands-on art activities, music, photo opportunities with Gumby, and a stop motion animation film competition. It will be fun for the entire family. You won’t want to miss it! See you there on June 14th. 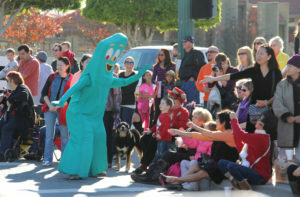 Gumby Fest will take place downtown Glendora at the library 10:00 a.m. – 4:00 p.m. Learn more about Gumby Fest at www.gumbyfest.net.